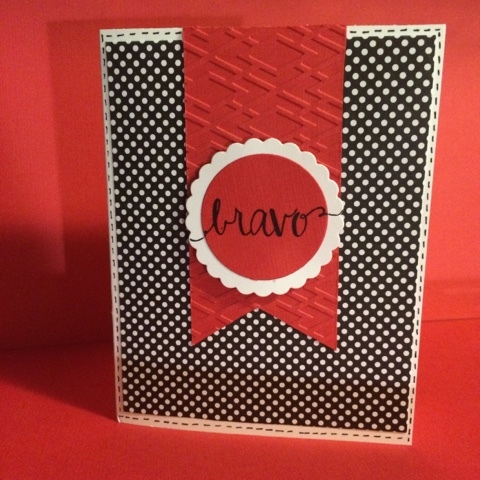 Check out this fun card inspired by award ribbons! I love this layout. I used a piece of foam behind the white scalloped circle to raise up the sentiment. I love how the tails of the letters hang off the red circle and are on the scalloped circle. I used a black pigment ink, but embossing this would look wonderful, too. The stamp is from Avery Elle's Oh Happy Day stamp set, and the embossing folder is by We R Memory Keepers. I am done making collegiate cards for now, and I have some great things planned for this week! I will be sharing with you some invitations, some papers I picked up at Scrapbook Expo, & a special surprise project!